Well look at that: the Newton-emulating Einstein connects to the Internet. Matthias Melcher got this little experiment up and running. Posted by davelawrence8 at 6:49 am on August 30th, 2010. No comments... » Categories: newton. Tags: connection, einstein, emulator, internet, matthiasm. Subscribe via RSS. 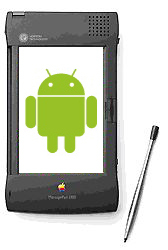 Is Google’s Android mobile platform the Newton fan’s savior at bringing a Newton-clone app to fruition? 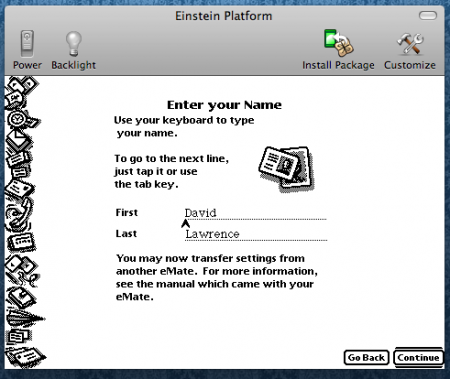 When Apple announced the iPhone SDK, I wondered whether someone could use it to develop an Einstein-based Newton app – even just to mess around with – for Apple’s Mobile OS X. Because of the licensing agreement, a Newton app is probably impossible. But on the open-source Android OS and its new Android Market, the dream of a modern-day Einstein hack might be realized. Now that Android has its own “app store,” some bootstrapping developer could do something really cool. A touch screen, a stylus, some sort of handwriting recognition, and access to the OS’s dates and contacts and notes, and you might be all set. I’m positive its nowhere near that simple to develop a Newton emulator for a mobile phone. But one can dream, right? Posted by davelawrence8 at 5:27 am on September 3rd, 2008. No comments... » Categories: newton, software. Tags: android, android market, app store, einstein, emulator, google, gphone, iphone, newton. Subscribe via RSS. 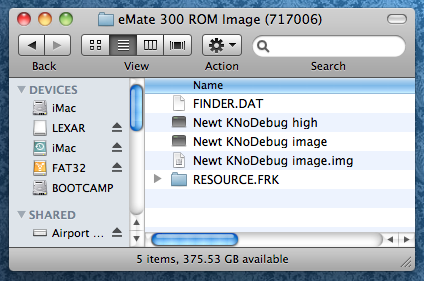 After the iPhone SDK was release, I wondered whether it would make sense to throw a Newton emulator in the mix. Shucks, I wondered whether it would even be possible. Leave it to Newton programmers to actually do the digging. SDK. Then tried changing targets to see what would happen. I did this for KLibs as well as Einstein. K Libs seems to build fine as a static library using the new target which was sort of surprising to me but since the BSD subsystem can be installed on the iPhone I thought perhaps it would work. When building Einstein for the new target I run into complications. There are two at the moment that I am facing. One is with missing X11 header files and the other with the K Libs dependency. Not sure why the compiler isn’t finding the X include files since I am certain the X11 SDK is installed and Einstein did build cleanly before. I am sure it’s just a configuration problem in the project that I’ve caused. So far I haven’t had any luck trying to resolve the dependency with K Libs that Einstein has by creating a new target, one that depends upon a new K Libs target for the new target device. headers than the system header files). 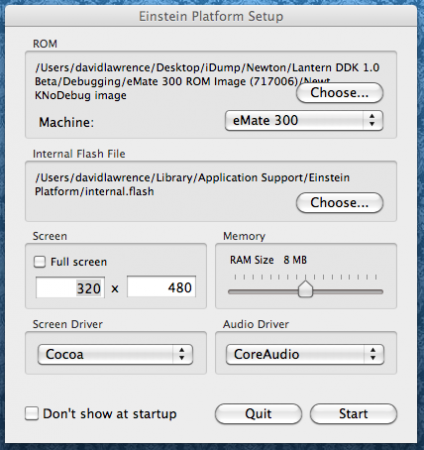 Einstein for iPhone must be built using the special iPhone version of Cocoa, which is quite similar, yet not the same. You have to use UIKit to generate the basic UI and emulator surface. I don’t know about you, but there’s hope to be found. Newton developers are working on the iNewton as I type this – and that’s a neat feeling. Give them all the support you can! Posted by davelawrence8 at 11:02 am on April 9th, 2008. 6 comments... » Categories: community, DIY, ipod/iphone, newton, software. Tags: apple, cocoa, developers, einstein, emulator, iphone, messagepad, newton, OS, sdk, UI. Subscribe via RSS. Looking to play around with the Newton – without the MessagePad? 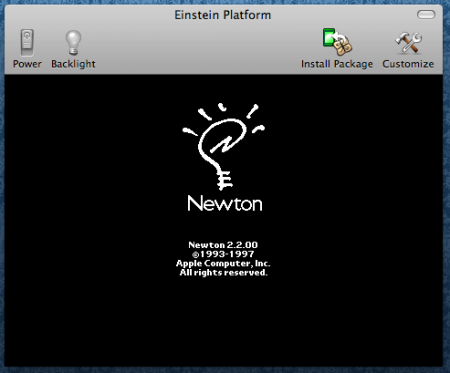 Einstein ports the Newton’s operating system ROM onto Macs and lets you play around with the OS on your desktop. The whole project has now become open source, called OpenEinstein. What I particularly enjoy is the reactions of other people. Some artificial intelligence researchers were amazed at this even if the handwriting recognition is no rocket science nowadays. Guyot’s efforts are part of a movement to get Newtons to connect with just about every OS and work on any non-Apple hardware – like this – available. Posted by davelawrence8 at 3:45 pm on December 3rd, 2007. One comment... » Categories: newton. 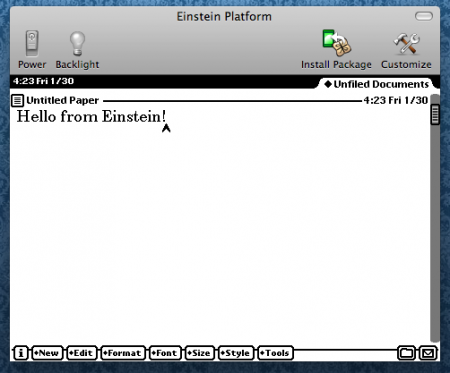 Tags: einstein, linux, messagepad, newton, open source, opensource, operating system, OS, PDA, windows. Subscribe via RSS.